One of the most beloved pieces of issued gear the Finnish military has to offer, these belts have been around for over half a century and are still going strong. Rugged, stylish and tough, and for those of us who've done service these naturally come packed with fond memories of honor and all that. The Finnish army has used two prong leather belts like these since WW2, but the real breaktrough happened in the 60's when this became the standard service belt to be worn with the M62 camo suit. These are one of the oldest pieces of kit still in use by our military, after the few imperial Russian Mosin Nagant bolts and the mess kits. 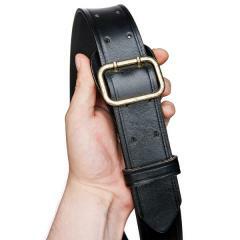 Nowadays these are used as trouser belts with the M05 uniform. About 45 mm wide, fits most civilian jeans too! The length is the total length, so choose a size at least 10 cm longer than your circumference to be able to close the belt. 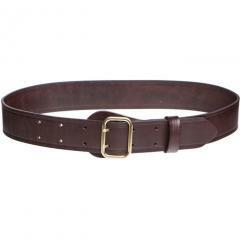 Extra qualified belt, great leather and great solid buckle. Thank you! Excellent belt. You can't get any better than this. Vyö vaikuttaa hyvältä kapineelta. Aika pehmyttä nahkaa..
Meni vaan vielä palautukseen ja vaihtoon, koska en sit kuitenkaan ymmärtäny tota kokohommaa vaan ymmärsin väärin et mitta olis reikiin..
Lukee, et pituus on vyön maksimipituus, joka ilmeisesti tarkoittaa vyön koko pituuttaa.. en silti saa sitäkään mistään suunnasta mittaamalla kuin 112 cm vaik sekin pitäis 115 olla?? No uusi pidempi koko arvontaan..
Kyllä mä silti tätä lähtisin suositteleen.. tosi monikäyttöinen..
Jos saisin autiolle saarelle valkata vaan kaks vyötä mitä käyttäisin, niin ne vois olla nää pirulaiset mustana ja ruskeana..
25v samalla vyöllä menty. Ainoa mitä tarvitset. Ikinä. WWoooaahhh , Nice, exellent belt !!! Great and strong style, one of the best belt i have . I'm in love ... Thank you Varusteleka ! Suosittelen varauksella. 2 vuotta kesti ja solki murtui. Ei päivittäisessä käytössä. Loistava vyö jos solki pitää. This is a superb quality belt, but it is unfortunately just a bit too wide to fit into a couple of my trousers' belt loops. No fault of the belt of course, as the extra width makes it even sturdier and more comfortable in the other 90% of my trousers. BEST BELT I HAVE EVER SAW IN MY ENTIRE LIFE! Was afraid I would be looking a little bit like Santa, but no. The buckles are just the right size. Belt is elegant, discreet, made for war, super rugged, and with a lot of thought and quality out into it. For the price is a steal. 6 Stars guaranteed. Keep the excelent work Varusteleka!! 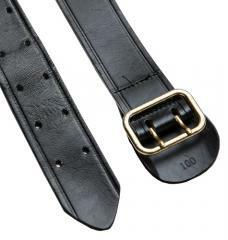 great belt, only size was a 105cm..... should have been big,, didnt fit too small. I have a 34-36 waist, 40 in belt should fit. It didnt.. Ill find someone skinnier in my family. Good belt, my trousers no longer fall down. As usual great service and a great price, even with UK shipping. I'm very pleased with the belt it goes well with casual wear and is long enough to wear over a jacket or heavy wool blanket shirt. Looks well made and robust and I am expecting it to wear well as it ages and softens and I am expecting to get years of service from it. The easiest way to do the sizing is to get a belt that already fits well and measure it from the end of the buckle to the other end. Go up a size rather than down if you fall between two measurements as that gives you the option of wearing it like the Fjallraven equipment belt, which is way way more expensive and doesn't even have a brass buckle by the looks of it. Ostin alkuvuodesta ensimmäisen miehistövyön ja olen niin tyytyväinen tuotteeseen, että tilasin toisenkin. Kankeus vyöstä häviää parin viikon käytön jälkeen. Mine appears to be new. Very well made belt. The leather is soft and quite flexible. Fit as described. It may well outlast me. Muuten ihan toimiva vyö mutta 7kk arkikäytön jälkeen meni soljesta toinen piikki poikki. Possibly the nicest military leather belt you can get, at great price too! My first time dealing with Varusteleka - fast service and delivery with no problems - now I have to get another belt for my demanding little daughter! Great belt although make sure you go size bigger. I went for the 125 cm belt for my 110 cm waist. It fits but wish I’d gone for the 135cm so if I was wearing thicker clothing it would go around. Jag köpte det här bältet i svart version för ett år sedan. Nu bestämde jag mig för att köpa den bruna varianten också. Ni förstår att jag gillar bältet! Varusteleka har alltid gjort mig nöjd. Några fler dagar i transport till Sverige är väl värt det. Looks sturdy but feels a bit cheapish IRL. It's alright but the Särmä leather belts which I also own are of much higher quality (thick quality leather, rivets instead of somewhat weak looking stitching and a sturdier buckle too). This is the belt for it's reputation and the feeling of an army-use. The material of the belt is bizarre. It's not like any leather I've encountered before - it has a rubbery look and feel all over, and it's seems to be much lower quality than what I expected. This most certainly isn't the ever-lasting army belt that we all wore back in the day. The buckle looks nice, as expected, but the rest just feels off. Olisi pitänyt ostaa vähintään 20 senttiä pitempi kuin vyötärönmitta, kun housut ja paita vievät vielä 10 senttiä. Ei kai tätä kukaan nakuna pidä, vaikka komea onkin. Kokoselostuksesta siis miinusta. Nice belt. Watch the sizing! It's the length of the belt from buckle to the end of the Belt, not of the last holes!